Just Carol: A Little Finish! I have a finish at last! It's only a little something, but it was a really enjoyable stitch, which I have finished as a scissor fob. All the stitches are specialty stitches, and although it's only a small design, it took a little longer to do then expected because of the specialty stitches. 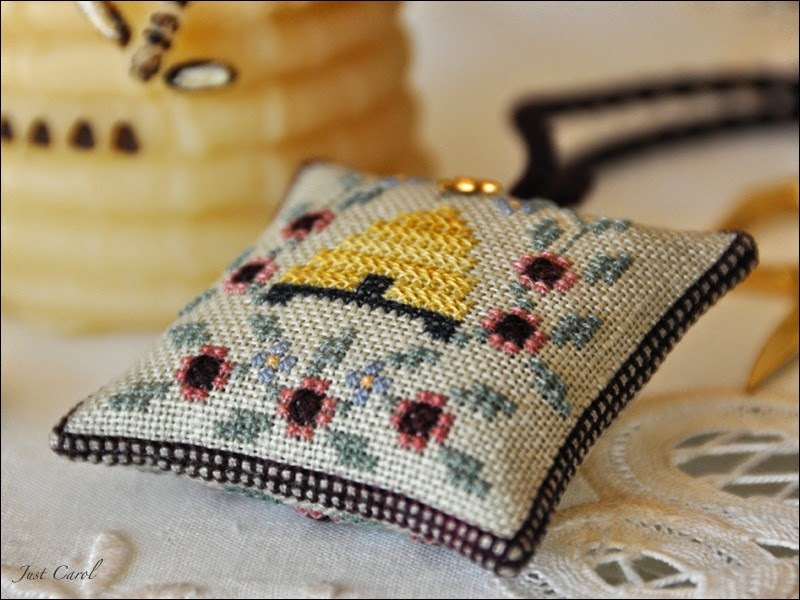 The design is a complimentary one from Keepsake Stitches, which you can find here. I substituted two of the Gentle Art Sampler Threads, as they didn't show up enough on the 32ct Putty Belfast linen that I chose to stitch it on. For the beehive I used Crescent Colours Finley Gold, and for the date on the back I used GAST Harvest Moon. I've made a little change too. 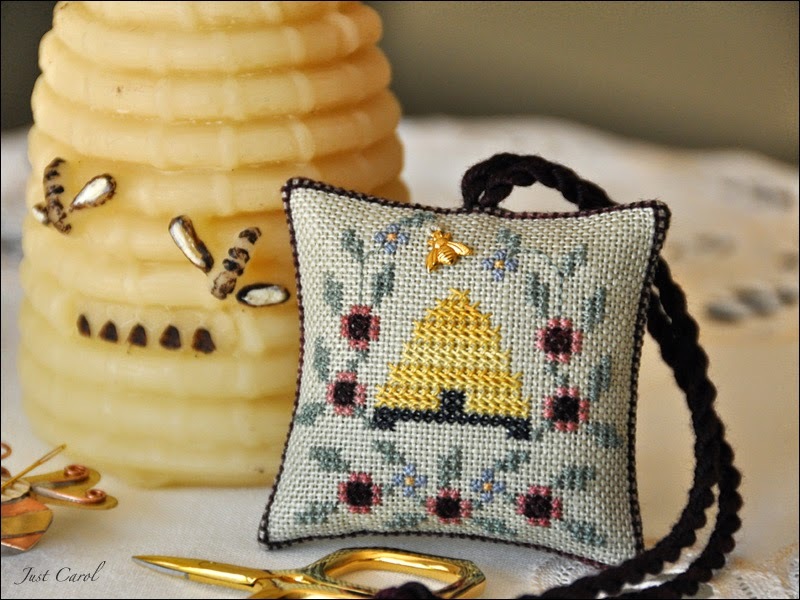 Instead of stitching the bee on the chart I've attached a tiny brass bee charm. Both sides are joined together using the four-sided square stitch. This is the first time I've joined two pieces together using the four-sided square stitch, and I wasn't too sure at first if I was going to like it as much as when I've whipstitched back stitches together, but I actually think now that it looks really nice! We are off on our travels again soon, so I won't be stitching for a while (and just when I had found my mojo again)! We have to return home to the UK for a couple of weeks to finish emptying our home for letting, a job we didn't quite get finished when we were there at Christmas. We are thrilled that our first tenants will be my brother and sister-in-law. They have recently sold their own home, and have asked if they could rent ours for a period of time, which is great for us, as we know it will be well looked after. I'm excited to see what postie has delivered for me too, as I have placed a few orders to be sent home while I've been here, so that I can pick them up to bring back with me. It will be like Christmas all over again...lol! I know I don't post very often these days, but thank you for popping by I really do appreciate it! I like the fourstitch finish! Very sweet and beautifully finished. How extremely convenient to have your family rent your home. Ein wunderschönes kleines Kissen, gefällt mir sehr gut. So pretty!! 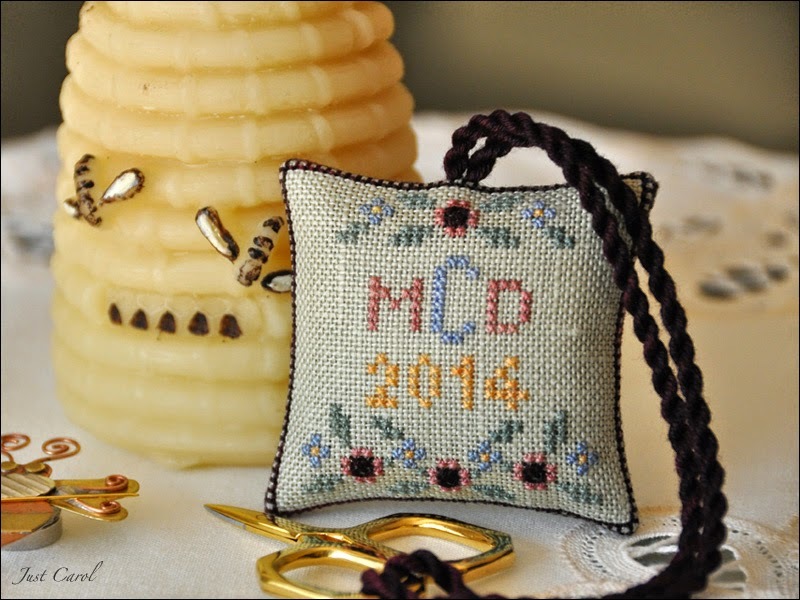 The four sided stitch makes a lovely edge finish and your bee charm is a delightful touch. Life is busy but I always pop by because when you do post it's always such a treat to see your work. Thanks for sharing the chart too. Perfect finish, it's really cute. Enjoy your visit back to the UK. Very cute finish! I really like the look of the four-sided square stitch. I'll have to look that one up for future use. Love the pattern and thank you for the link. I like the idea of the charm instead of stitching. I try to do that mysself, makes it special.The stitching is perfect. It's always lovely to see a post from you ... whenever it my be. A lovely scissor fob, so pretty. Thank you for the link. Nothing "just' about your finish at all Carol - unless you say it is 'just' perfect and 'just' charming! Hola Carol he visto los acericos que haces y me encantan todos ! !no conocía tu blog a si que me quedo para ver tus trabajos. Very pretty and nicely finished as always.